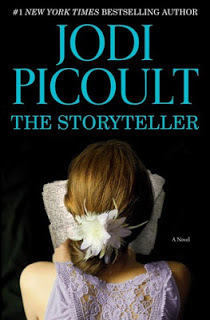 Always a fan of Jodi Picoult, I had no doubt about reading this novel. What I wasn’t expecting was to be completely blown away and left speechless. Picoult has outdone herself and this book will be hard to beat as my favorite of hers. I have always loved historical fiction and especially those set during WWI and WWII. Even though it is hard to “love” a story about the horrors of the Holocaust, they have always hit me to the core. This one was no exception. Picoult has a new way of telling the stories of victims and survivors and giving us a different perspective to contemplate. Picoult expertly tells the stories of Sage, her grandmother Minka, and Josef taking us into their past and bringing us to their present. There are tragedies, horrors, bits of hope, and a fairy tale that keep you turning the pages. You will gasp, cry, and cringe as the story of Minka is told. Knowing she makes it through is what keeps you reading and reminds you to have hope in the midst of evil. The underlying theme of forgiveness spoke to me the most. I’ve personally learned that harboring anger and resentment only continues to feed the monster in your head and in your heart. Picoult’s message of forgiveness rang true to me and reminded me of one of the best decisions I have made….to forgive and let it go. This was our book club choice for the month and I think all of us could have talked about this book for hours. Unfortunately, we had to go back to the reality of motherhood. But, each one of us commented on how much this book affected us emotionally. I don’t think I have ever highlighted so many passages in one book. Picoult has an expertise in telling a story with life quotes and lessons that you want to remember forever. Without a doubt, pick up this novel at your local library or bookstore and set aside a day or two to read it. The story will linger with you for days and it may even change you.